Every so often Ford gets the Mustang just right, and when they do, I generally like them. I’m not part of the cult though. I think there have been downright terrible Mustangs in the past, and I think the continued beatification of Carroll Shelby is annoying and misplaced, but with that said, the 2019 Mustang Shelby GT350 sure looks like it’ll impress. 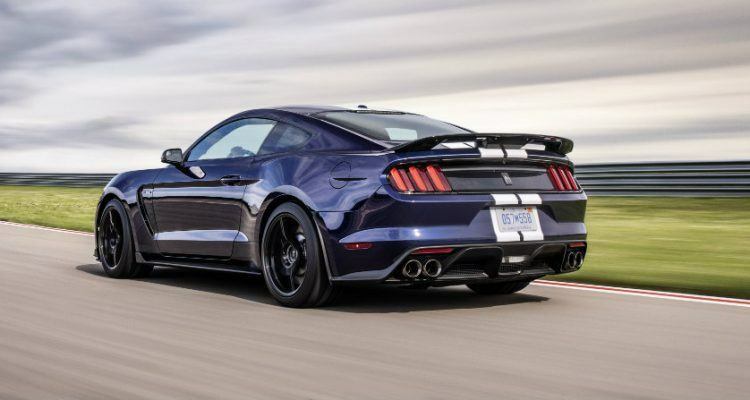 Ford is right up front with how they made the upcoming GT350 better: “. . . Ford Performance leveraged its Mustang road course racing programs . . .” These words are music to a track hound such as myself. See, racing does improve the breed (a pun in the case of a car named after a horse). 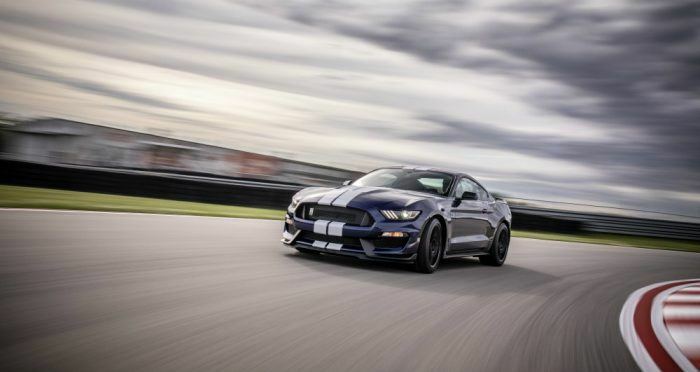 So what makes the 2019 GT350 so good? For starters, FoMoCo burned the midnight oil with Michelin so they could burn the rubber more effectively. 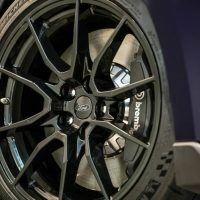 New Michelin Pilot Sport Cup 2 tires were engineered with a Shelby GT350-specific tread pattern and compound for more grip, and considerably enhanced acceleration, lateral grip, and braking. The boss meats are 295/35 up front and 305/35 at back and fitted to 19-inch aluminum wheels. 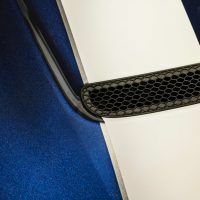 Ford also worked the aero with a new rear spoiler, optional Gurney flap (buy it), and an adjusted grille closeout based off the upcoming Shelby GT500. 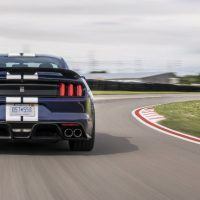 Ford also upgraded the Mustang Shelby GT350’s standard MagneRide active suspension to harmonize the aero and tire developments, along with re-calibrating the springs and revising the damping. 2019 Mustang Shelby GT350. Photo: Ford Motor Company. The Shelby GT350 is propelled down Woodward with an exclusive, high-revving 5.2-liter V8, delivering 526 horsepower and 429 lb-ft. o’torque. It revs all the way up to an 8,250-rpm redline, making said mill the most powerful naturally-aspirated Ford production engine ever. Naturally, the 5.2 8-banger is mated to a track-proven Tremec 6-speed manual transmission. Wanna stop? You will, and in no short order, thanks to six-piston front and four-piston rear caliper Brembo brakes. 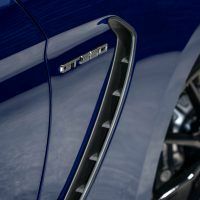 The Shelby GT350’s steering is an electric power-assist deal, and there are three different modes for the electronic stability control. On the inside, you lucky drivers are indulged with a comfortable and trendy cockpit featuring the latest in advanced technology and premium materials. There’s a standard machined aluminum instrument panel appliqué or an available exposed carbon fiber option. The door panel inserts are newly designed in dark slate Miko suede with accent stitching (no, I don’t know what or who Miko is either). The seats are standard Recaro racing bits with open pass-throughs for safety harnesses. 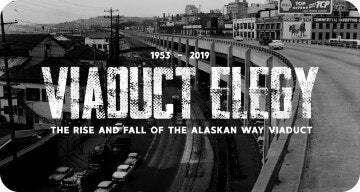 Soundtrack? 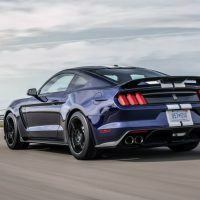 For me, that comes from that 5.2-liter plant, but for those that like to listen to music, the 2019 Mustang Shelby GT350 comes with a new, custom-tuned 12-speaker B&O PLAY audio system by HARMAN, controlled via the standard eight-inch SYNC 3 touchscreen. Dual-zone temperature control is now standard so your passenger can shut up about being too hot or too cold, and Ford even threw in a universal garage door opener. There are also these strange mirror-mounted Shelby Cobra Projection Lamps in the available Technology Package. 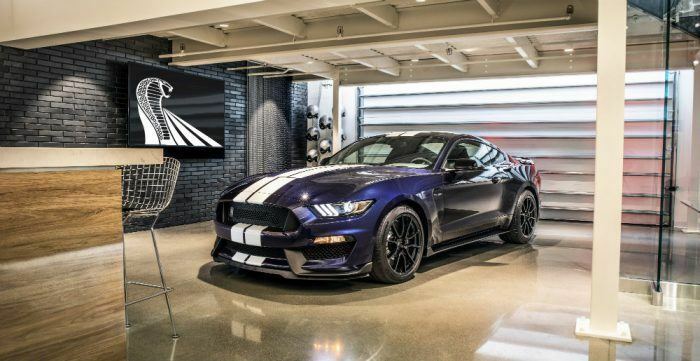 The new Mustang Shelby GT350 will be available starting in the far off days of early 2019 (too far away!). And not only do you get the car, but you are also enrolled in an exclusive, complimentary Track Attack driving program from Ford Performance. How nice of them. Photos & Source: Ford Motor Company. No Comments on "Look Out Buddy! 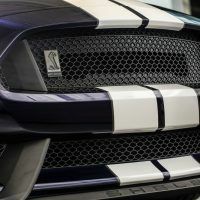 The Upgraded 2019 Mustang Shelby GT350 Is Coming"